This is the first day of tomorrow. You don't know who this group is, what you represent is a lot of things that are going to take place in this state. Evidence shows that when you have a city council, a development authority, a county government, and a school system that come together make things happen, this is what happens. What's happening here today, truly we've broken the ice! Bringing solar to Georgia hasn't been an easy thing to do. I had the privilege before Christmas to be in Germany for a week, looking at the process of energy in Germany. ...people with the energy business in Germany, and they look at Georgia and they say "if we only had half of the opportunity that you have with that beautiful sun shining on your state." They're going to be on renewables by 2020. And we're just starting. And again: this is the first day of tomorrow. Georgia Power and its parent the Southern Company were prominent by their absence from these festivities on this day. I know things are tight and we're really struggling in education, and he said we need to find ways to reduce our costs. And I said solar should do that for you if everything is put in place. Solar now has reached a point; the technology has been there for some time; costs have reached a point now where it really makes economic sense for us. And we have to be looking at that as Commissioner McDonald said, on a really broad field and on a small scale with the residential, school systems, businesses, and whatever. Thomas praised Robert Green of Greenavations for financial analysis and Evergreen that's going to do the installation, and "our whole team and how they've worked together". 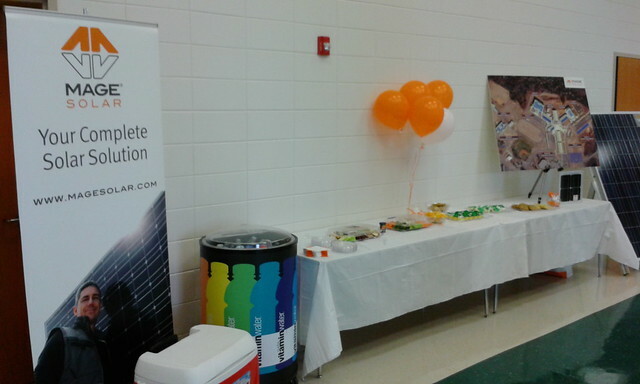 The Superintendent praised Robert Green of Greenavations for working with him and MAGE SOLAR to come up with "the right size with the right financing model to make it a great money saver for Dublin Schools." 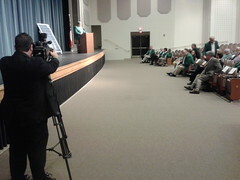 Robert E. Green of Greenavations praised "the greenest high school in Georgia." 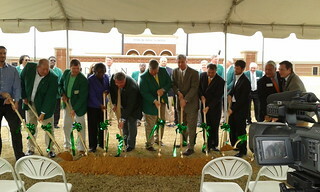 This was not only a groundbreaking event for this school. It's also, because this project represents the first use of municipal bonds to finance a solar array in the state of Georgia, with this development, and the forethought of the people gathered here today, we can unequivocably state that Wall Street and Main Street have agreed that there is enough sunshine in Georgia for solar to succeed as a way to drive down educational costs. 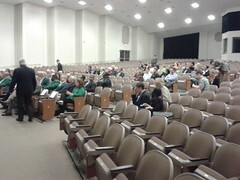 Green described his other company, Georgia Solar Utilities, saying GaSU would be offering a curriculum on solar from financing to installation. This is a first: the cooperation! This day would not be here if it weren't not for all these people working together. He added to the list Cal Wray of the Dublin-Laurens Development Authority. Together we can do things we never thought were possible. 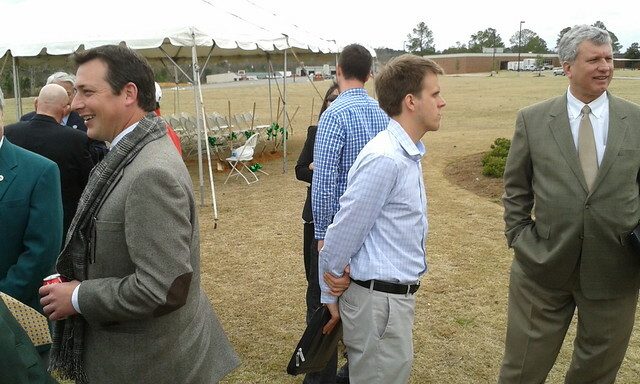 One of the brains behind the solar initiative in Georgia is Shane Owl-Greason... He lives, eats, and sleeps solar energy. When you have a solar array working today, you might say it's a cloudy day, you're not going to make any power. Not so! That means that on a day like today it will probably be close to 50% production. the temperature being what it is and the amount of power we're using in Dublin High School we can probably power Dublin High School today. It's an interesting point and for an old country southern boy who thought that solar must mean only when the sun is popping out at 95 it's an interesting point to learn and to grow. 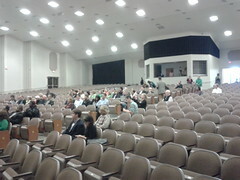 A long line of cooperating people went outside and broke ground with golden shovels. 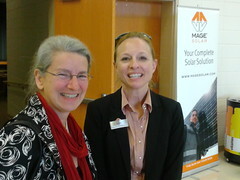 Gretchen interviewed Cal Wray, President of the Dublin-Laurens Development Authority on how bringing MAGE SOLAR to Dublin in 2010 started the ball rolling to where now industry, government, schools, residential, all are involved in solar and ramping up. He's the one who went to Germany and found MAGE SOLAR. Maybe looking farther afield than Alabama or Tennessee is profitable. Finally, here's the site plan for solar Dublin High. 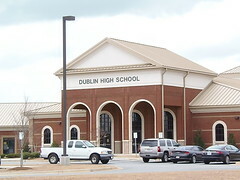 Dublin, Laurens County, Georgia, 11 March 2013.